Have an MJ memorabilia item not on our site? Add it here! An octagonal prism plaque commemorating the BAD Tour that was given to the executive director of MJJ Productions. Five of the eight panels lit the cities where Michael performed. Topped with two goldtone unicorns. Oil on canvas by Samantha Wendell, signed by the artist in lower right corner. The painting shows Michael on stage performing Billie Jean, with fedora. Black Epiphone Les Paul guitar custom painted by Cleveland, Ohio, artist Neal E. Hampton in 2009. 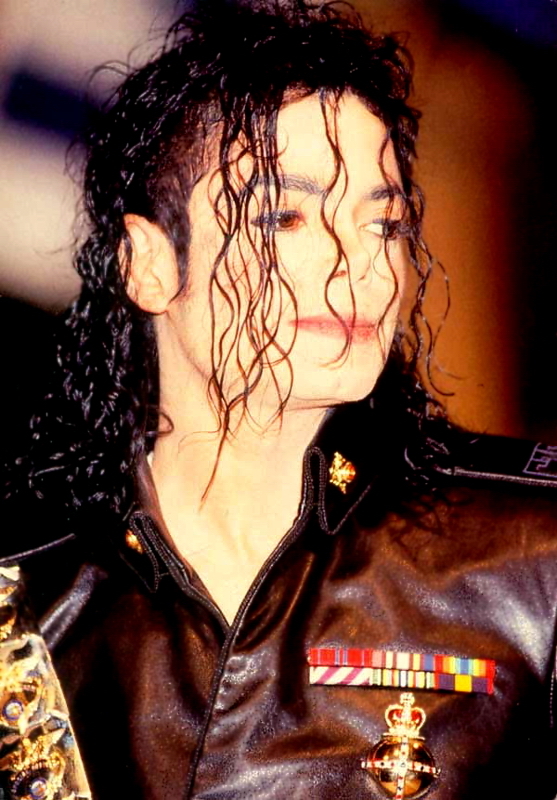 With a portrait of Michael from his 2009 O2 press conference on the front and his dancing silhouette on the back. Original pencil, marker and watercolor on board concept sketch for an Captain Eo costume featuring various mirror plates adhered to the board. Signed by costume designer Ted Shell in pencil. An original pencil and marker on board costume concept sketch for Michael Jackson's Captain EO costume. The sketch is signed by costume designer Ted Shell in pencil in lower right. The original Disney artwork for Michael Jackson's 3-D short film Captain EO which was used on the film poster, Disney attraction posters, comic book art, and Disney merchandising. Captain EO life-size production model of "The Supreme Leader", played by Anjelica Huston. Captain EO pencil sketches of "The Supreme Leader", played by Anjelica Huston. Signed "Tom Bari/ Burman '85." A handmade wooden chair "Swarovski", from the collection "Haute Couture" by Carlo Rampazzi. Upholstered in metallic leather with platinum gold leafing and Swarovski crystals. Pen and ink drawings of the ghouls from Ghosts and pencil drawings of Michael stretching his skin and smashing his skull. Each drawing is signed by the artist. Hand mirror used by Michael in the role of the Mayor in the short film Ghosts. Made by Stan Winston Studio and given to the prop master of the film by Stan Winston and Michael. Set of 10 storyboards in acrylic from the short film Ghosts featuring illustrations for the scene where Michael smashes his hands and head against the floor. Numbered 1 through 30. Script for the Jackson 5 TV special "Goin' Back To Indiana" that aired on September 19, 1971. A cartoon script for the animated Jackson 5 cartoon series first aired in 1971. The script's title reads "Groove To The Chief". Script for the animated J5 series from 1971. The cover reads: "Moe White and the Seven Dwarfs [sic]". The title of the episode was later changed to "Michael White". The script is marked with "#19". Scarce Michael and Lisa Marie Presley's Wedding Chocolate bar given as a souvenir to some of their guests.Their names are encaved on the bar covered by a gold wrap.